"Austria, where I studied. 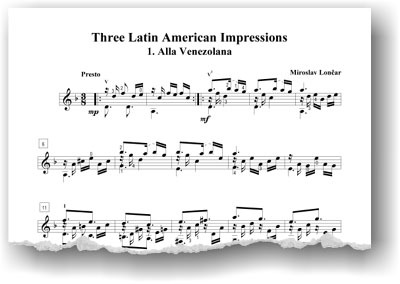 The idea and encouragement to write three character pieces in different Latin styles was given to me by the Croatian guitarist Mario Nardelli, Jr., who subsequently performed the pieces several times on his concert tour of Yugoslavia in 1983. Some twenty years later, another Croatian guitarist Zarko Ignjatovic, requested the manuscript, which led me to take a new look at the pieces and do several revisions. Since I made the revisions Zarko has performed the pieces numerous times in several European countries. 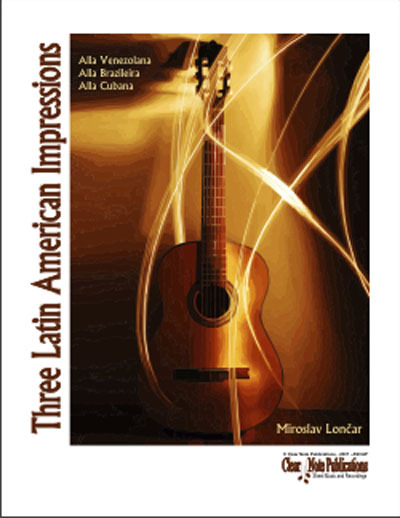 As suggested by the titles, the Three Latin American Impressions are inspired by the music of the great composers, Antonio Lauro, Heitor Villa-Lobos, and Leo Brouwer." Croatian guitarist Miroslav Loncar is an active teacher, performer, composer, arranger, clinician, and promoter of classical guitar. He composed his first guitar pieces to fill his young students’ need for fun and easy repertoire. Since those early pieces, he has written compositions for solo guitar, two guitars, guitar quartet, and mandolin orchestras. Loncar has taught guitar at various instructional levels, from elementary to university, and teaching young students has been his constant inspiration to compose. Miroslav has formed and directed several national and international competitions and summer schools in Croatia and the United States. He has adjudicated a number of competitions including the Guitar Foundation of America International Competition and the Music Teachers National Association National Competition. Miroslav performs frequently in the Klasinc & Loncar Guitar Duo with his wife. As a soloist, he has performed with a number of symphony orchestras in Austria, Croatia, and the U.S. Loncar received his education at the University of Graz in Austria, where he studied the classic guitar with Marga Bauml and Martin Myslivecek. One of today’s great guitar composers Dusan Bogdanovic provided Miroslav instruction and guidance in composition.